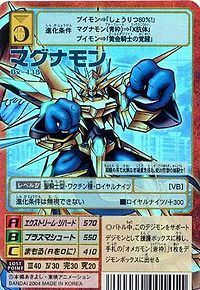 An Armor-level Holy Knight Digimon that evolved through the power of the "Digimental of Miracles". 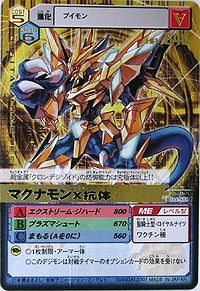 The "Digimental of Miracles" possesses the attribute of "Metal", and is made of the super-metal "Chrome Digizoid". 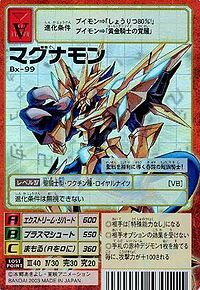 It possesses not only tremendous defensive ability, but also offensive power equivalent to that of an Ultimate Digimon or even greater, and it is also a member of the "Royal Knights". Those who acquire the power of the "Digimental of Miracles" are able to overcome any predicament they fall into through that miraculous power, and as such it is appropriately referred to as a Miracle Item. Its Special Moves are firing a shot of ball-shaped plasma (Plasma Shoot), and firing an energy wave from its entire body using the power of the Digimental at maximum output (Extreme Jihad). 'Chrome Digizoid' grows stronger the more it is tempered, and there exists no other material quite like it. Magnamon's imaginary super-metal had become one with its limits, and was able to grow and regress as if it were made of muscles. 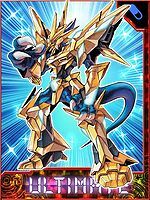 The natural form of 'Chrome Digizoid' (in other words, the Digimental of Miracles) was created using ancient technology, and its original characteristic was how it could be integrated into living organisms; a state similar to that, when combined with Magnamon's abilities, is thought to be the manifestation of a miraculous evolution. 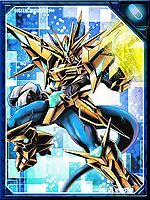 When Magnamon's muscles, or 'Chrome Digizoid', are strained, they temporarily transform into "Gold Digizoid", which envelops its entire body in a golden glow; not only does it raise physical defense, it also bestows a state of absolute defense that is capable of resisting even data-disintegrating types of attacks. Furthermore, when in the "Gold Digizoid" state, its properties are similar to those of the Huanglong Ore, which boasts unparalleled, absolute hardness and is used as the base for 'Chrome Digizoid'; as such, in addition to absolute defense, it also adds a great amount of weight ill-suited for Digimon, though Magnamon has overcome that by tempering its own 'Chrome Digizoid'. A Holy Knight Digimon that evolved through the power of the "Digimental of Miracles", and a member of the "Royal Knights". 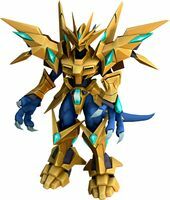 Its armor is made from the super-metal "Chrome Digizoid", but it has been completely integrated with Magnamon's body through X-Evolution, to the point that it possesses a nature similar to muscles. 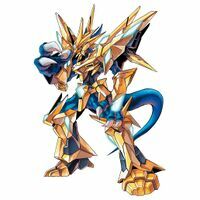 During battle it will increase its hardness, and if it enters the "Gold Digizoid" state in which its entire body shines gold, it is completely invulnerable. Special Move: Emits an energy wave from its entire body (Extreme Jihad). | Magna 「マグナ Maguna」 means large or great. Extreme Jihad  エクストリーム・ジハード Ekusutorīmu Jihādo Unleashes all of the energy of the Digimental in one large explosion. Plasma Shoot  プラズマシュート Purazuma Shūto Fires a sphere of plasma. 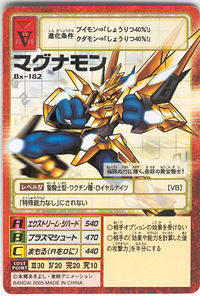 Magnamon X-Antibody is available as a Digimon Medal. 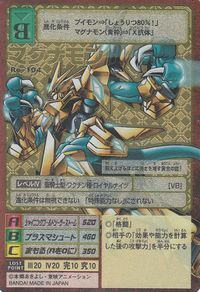 Can be obtained as a Blast Evolution of Cannonbeemon or Tiger Vespamon. This super-steel knight of miracles takes the lead to emerge victorious from the holy war! This grappler boasts absolute defense, having obtained unparalleled rigidity as a result of its training! 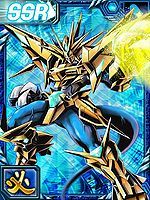 This golden knight of miracles shines at the limits of its power! Its golden armour grows stronger the more it is tempered! 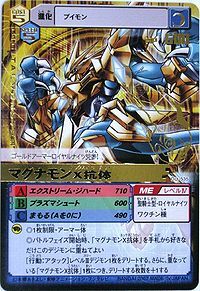 The defensive ability of the super-metal, 'Chrome Digizoid', surpasses that of Ultimate levels!! This Royal Knight arrives, clad in golden armor! This page was last modified on 16 April 2019, at 02:33.